This is the NEW UPGRADE VERSION of the Super Antenna MP1 SuperStick antenna. The popular portable ham radio antenna for transmitting and receiving on HF and VHF bands. Rated #1 in the HFpack Portable Antenna Shootouts. Great for keeping a low profile, taking an antenna with you, or in place of a permanent outdoor amateur radio antenna. NEW with this version: Self-Locking SuperSlider. Manually slide its SuperSlider coil to your desired frequency and start transmitting with a good SWR. This upgraded MP1C antenna packs down to fit in your Go Bag, then instantly expands up to full size when you need it for Emcomm deployments, DXpeditions, or temporary base installations. Great for manpack, /PM Pedestrian Mobile work, Survivalist and Prepper Communications in a Bug Out Bag, Emergency Communications. Super Antenna offers a whole range of mounts, accessories, and options to go with the MP1C SuperStick Portable Antenna. Recommended Mounts: SuperAntenna UM2, TM1, TM3, TM4. Recommended Super Antenna radial sets: MR4010, MR642, MR1710, MR4020, MR8060, MR8075, MR6060. Comes with the Super Antenna FG1 Frequency Guide SWR Ruler. [Contents of this package: a Super Antenna Model MP1C Portable Antenna, consisting of 1 SuperSlider, 1 Telescopic Whip, 2 extension rods, 1 coupling nut, 2 instruction sheets, 1 FG1 Frequency Guide SWR Ruler] [Antenna materials: Aluminum, Brass, Beryllium, Copper, Polymers] Genuine Super Antenna® designed in Silicon Valley, USA. COLOR: Black and Metallic. WEIGHT: 1 pound (0.5kg). FITTINGS: This antenna has a 3/8"-24 male fitting at the bottom. RECOMMENDED ACCESSORY MOUNTS: UM2 SuperMount Universal Clamp Mount, TM1 Low Profile Portable Tripod, TM2 SuperPod Large Portable Tripod. Also attaches to most standard ham and CB mounts. Requires a standard 3/8"-24 mount for operation. THIS IS ONLY AN ANTENNA. THIS ANTENNA REQUIRES A MOUNT FOR OPERATION (sold separately). ACCESORIES: See promotions for discount accessory options sold by Super Antenna below. 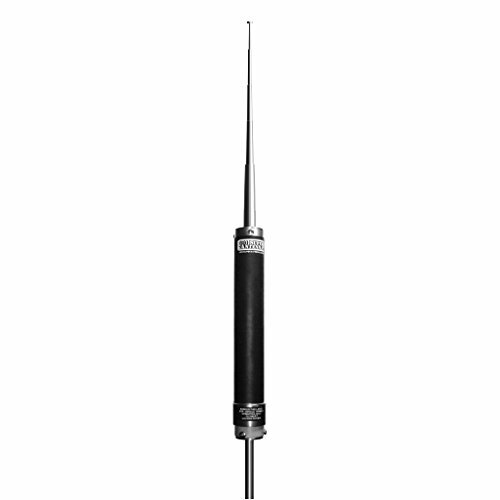 NEW UPGRADE VERSION of the MP1 Super Antenna® Ham Radio Portable Antenna for HF - VHF. For Indoor or Outside field use. Big signal in a small package. The #1 HF Portable Vertical Worldwide. NEW with this version: Self-Locking SuperSlider coil. THIS IS: The Super Antenna MP1C Antenna with FG1 Frequency Guide SWR Ruler. Mount Not Included [sold separately] . Genuine Super Antenna® product designed in Silicon Valley USA. SIZE: Packs down to 12" (30cm) for portability and extends up to 7ft (2.1m) for operation. Can be used in vertical or horizontal position. DX and NVIS. Easy set up by 1 person in two minutes without tools. ANTENNA FREQUENCY RANGE: 40m-30m-20m-17m-15m-12m-10m-6m-2m-220 Ham bands. HF 7MHz-30MHz continuous all bands shortwave and VHF 30MHz to 300MHz all bands. [3.5~6.9MHz can be added with optional MC60 SuperCoil 60m or MC80 SuperCoil 80m/75 sold separately] HAM-MARS-CAP-CB-MARINE. CONTENTS: 1 Super Slider Coil. 1 Telescopic Whip. 2 Extension Rods with Coupling nut. 1 SWR Ruler. INCLUDES SWR RULER: The FG1 Frequency Guide provides easy tuning to any frequency or band. GOOD SWR: below 1.5:1 or better, no analyzer or tuner needed. High Q SuperCoil. SuperSlider tuning is manually adjusted by user for Maximum Efficiency. Telescopic whip with standard 3/8"-24 fittings. ACCESORIES: See promotions for discount accessory options sold by Super Antenna below. POWER RATING: 500 Watts SSB (300W CW/Data). COLOR: Black and Metallic. WEIGHT: 1 pound (0.5kg). FITTINGS: This antenna has a 3/8"-24 male fitting at the bottom. RECOMMENDED ACCESSORY MOUNTS: UM2 SuperMount Universal Clamp Mount, TM1 Low Profile Portable Tripod, TM4 SuperPod Large Portable Tripod. Also attaches to most standard ham and CB mounts. Requires a standard 3/8"-24 mount for operation. THIS ANTENNA REQUIRES A MOUNT FOR OPERATION (sold separately). THIS IS ONLY AN ANTENNA. If you have any questions about this product by Super Antenna, contact us by completing and submitting the form below. If you are looking for a specif part number, please include it with your message.